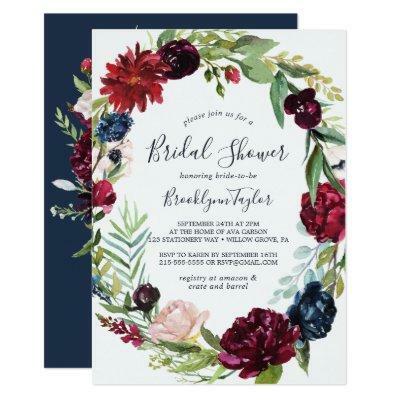 This autumn garden burgundy wreath bridal shower invitation is perfect for a fall wedding shower. The floral design features stunning blush pink, red, navy and burgundy watercolor flowers, blossoms and green leaves arranged in a lively fall wreath. Personalize the back of the card with the name of the guest of honor and the event.